Wendy's 3-D Cats: 3-D CATS TOGETHER AGAIN! 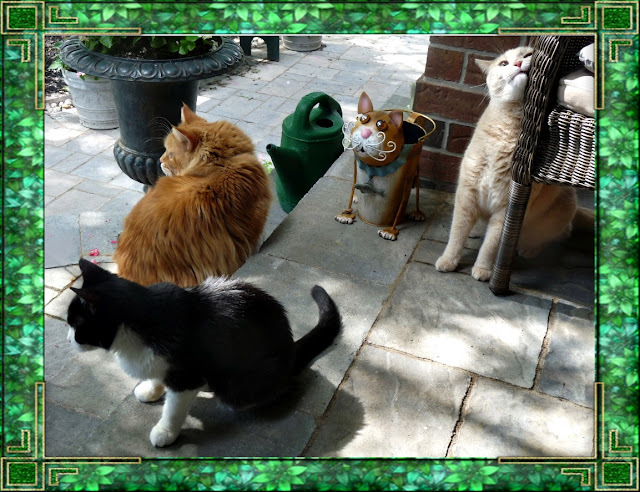 Here are the 3-D Cats in a rare photo of them together from summer 2013. Domino's on the left, Dylan's on the right, and Dante's in-between. Not to mention the googly-eyed tin planter cat who's overlooking efurrything! This is a lovely memory which I will cherish always. It's a happy and harmonious moment in time, captured forever. And this was the not-so-tranquil aftermath! Another memory that only brings smiles. That is a great shot of all three. Yes, that really is a nice memory of the gang.